Around a third of the homes at the Barfoot & Thompson auctions monitored by interest.co.nz last week were sold under the hammer, with clearance rates ranging from 32% to 37% and the remainder being passed in for sale by negotiation (see table below). There was a big increase in auction numbers last week and Barfoot's had so many on the Order of Sale at their Shortland St auction on Wednesday that the they had to split it between two rooms and hold two auctions simultaneously, each with more than two dozen homes going under the hammer. However buyers continue to remain more cautious than they were a few months ago and a notable feature of many auctions is that there are often more properties that don't receive any bids than there are those that sell under the hammer (see below). However there are also some properties that attract extremely competitive bidding and sell for exceptional prices. At the Manukau auction the prices of the properties that sold under the hammer started at $571,000 for a three bedroom house at Manurewa, at the North Shore auctions the cheapest price of homes sold under the hammer was $625,000 for a house at Mangawhai Heads and at the auctions conducted at Barfoot's head office in the CBD, the cheapest sale was $395,000 for a one bedroom apartment. 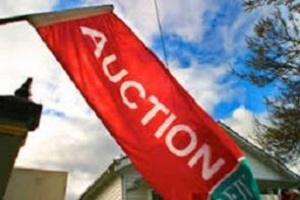 To see the results (including prices) from all the auctions throughout the country that have been collated by interest.co.nz go to our Auctions/Sales Results page. *Excludes results from minor auctions and those conducted on-site. You can receive all of our property articles automatically by subscribing to our free email Property Newsletter. This will deliver all of our property-related articles, including auction results and interest rate updates, directly to your in-box 3-5 times a week. We don't share your details with third parties and you can unsubscribe at any time. To subscribe just click on this link, scroll down to "Property email newsletter"and enter your email address. Wow it is changing. I wonder how many agent's cars will be repossessed as things slow down even more. If you are looking for tidy low mileage european cars it might be advantageous to hold off and wait for some panic selling to occur in Auckland before the finance companies come a looking. Looks like the big freeze is coming. yayyyyyyyy and just when I am trying to buy. Now I can sit here and freak out if this house (OVERPRICED) house is even more of a lemon than I thought. It may still be the right time for you to buy, or not. We're at the price peak now so I would personally cancel house hunting but it depends on circumstances and if you can wait a few years while the bubble unwinds. I am not in Auckland but I have noticed more houses with price tags where I am. But also some are just crazy prices. But then I looked at homes.co.nz and saw some August sales on there which seem lower than what I would expect. I am waiting to see if rest of the country follows Auckland. Do we buy now or wait?! I want to wait personally. But I have been waiting years and years for the housing market to stop forever climbing. With low rates and foreign buyers and investors all making it go up. But I also think they cannot keep rates low forever, how long do they stay low for? I just want a roof over our heads not to make money but I dont fancy losing lots either. EDIT: and if you wait, where do you put your money where it is going to be safe, I mean banks in NZ have no guarantee do they. In a sense I think you have answered your question. The price of a house will fluctuate but one thing that matters is having a roof over your head. Look at how much your mortgage payments would be. If you have enough deposit that your outgoing payments are similar to the rent you are payment then it might be worthwhile. I bought a house a couple of years ago because the numbers stacked up, and I had a 20% deposit. With the current prices and cost of finance I wouldn't buy. I do recommend avoiding treating an owner occupied house as an investment. It's a lifestyle choice not an investment. If there's a crash that affects the stability of our banks regular accounts, term deposits, etc are not safe. Buying a house and staying slightly in debt on a floating rate account or shifting your money to a share trading account is a lot safer. There is no 100% protection but that doesn't mean you shouldn't take measures to protect yourself. "..or shifting your money to a share trading account". I'm curious about this comment dictator. ANZ has such a cash management account under their ANZ Securities banner. Are you suggesting that would not be subject to OBR? the only safe place is offshore or government bonds. Well .... everyone was saying 'naaaa it will never happen in Auckland'. I was always saying that the solution is to curb the unnatural, inverstor and overseas buyer demand - not to increase the supply. Moreover - I have spoken to an agent that told me that the asking price now has to be approx 10% lower than 2 months ago if you really want to sell. Also ~100 (5%) listings more on trade me within a week for Auckland. It will not make big difference for the people that want to buy top end houses (2m+ i would say). They have money. Do you mean 'open homes' for 2 weeks? What location or maybe even a link? Is it DGZ? Hope it sells above and beyond, the market is hot! Yep well looks as though the Over seas investor market has finally taken the hint and backed off, since the recent events in Canada's BC. That and Auckland investors have realized that the income ratios from AKL property isn't worth investing in so have moved on to greener pastures. So it's not surprising that the Auckland market is cooling and possibly crashing, though probably not as dramatically as Vancouver. Interesting new tactic in Hong Kong. Just introduced 15% Stamp Duty on ALL property purchases other than first time buyers. ... and then go back up again and then down and up and down... and so on. As has always been said, some of those trying to time the market will be caught out and lose. So be it. Most sensible investors haven't been buying in Auckland for a long time and are not worried about a (relatively) slight drop in values. We've made a killing over the past few years so why would we? I think we all expect it! As for home owners. Sit on your hands. Don't read about house prices for a few years and carry on! Before you know it the property cycle will do what it does and you'll be seeing prices rise again.